Q: What makes the water-fed pole better than other established washingprocedures? A: Unlike the original ladder & sponge method, the water-fed pole allows the cleaners to reach panes from the comfort of the ground. The telescopic rod is 22 metres tall and can easily reach even stains on the fourth floor of your premises. 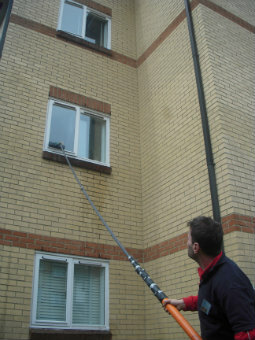 Q: What other cleaning options are included in window cleaning Chingford? A: Besides providing diligent exterior window cleaning, the licensed technicians can also ascend and wash any commercial skyscraper – a service named rope access window cleaning. Finally, the cleaning adepts can also take care of grime found on the interior side of your panes, and will employ ladders and squeegees to access out of reach corners. Q: Why are there still water droplets on my glass surfaces even after you've washed off all dirty marks? A: Our water has been filtered from all naturally contained hard minerals. As a result, it will efficiently absorb all blemishes on its path and will vaporise under the sun without leaving residue marks of its own. A: Yes, the Chingford window cleaners will arrive with the latest cleaning gear to rinse industrial buildings both small and elevated. The pros can also carry out additional washing tasks, for example patio washing and gutter cleaning. A: Naturally. The team's water-fed rod is attached to a special purified water storage inside the washing caravan. In case the water has been used up, the experts will kindly ask you to provide them with any interior or external water source. Q: Will I get a compensation in case of any unintentional property damage? A: Yes, all our services are completely insured for your ease of mind. However, our cleaning method is among the soundest that you can find on the market and we'll make sure to rinse your panes without leaving a single scratch! With our window cleaning in Chingford, you get a meticulous clean of your sash windows, skylights, glass roofs, French doors, and other glass surfaces at fair prices. We will even offer a free of charge treatment of all PVC & UPVC window elements! For a full list of our prices, please view our price table below. With window cleaning in Chingford, you can swiftly remove long-forgotten splodges from any industrial or residential property. Read on to find out how. To wash your windows' exterior facet, the practiced window cleaners in Chingford will deploy the latest cleaning gadget – a water-fed pole that runs on distilled water. The washing tool's significant reach (22 metres) allows the technicians to banish blemishes from any four-storey premises without using ladders or unpleasant detergents. To remove stains on rise buildings, we've come up with a wholly different cleaning procedure – the rope access window washing. After evaluating your property's size and whereabouts, a team of reliable climbers will either use ropes or ladders and squeegees to reinstate the former glory of your panes. We always organise each session ahead of time to avoid mishaps and can offer you all the necessary COSHH documentation upon request. To renew windows on the inside, the specialists may have to bring along sponges and ladders to reach hard-to-get places. In our aim to cater to as many Londoners as we can, we've expanded our window cleaning in Chingford to encompass extra areas across London. For your convenience, we've mentioned the names of these neighbouring locations below. Another quick and easy way to get a free instant quote or to book window cleaning services Chingford E4 is through our web site.